Fsociety has carried out the biggest hack in history, bringing E-Corp to its knees. But the world economy is crumbling as well, sparking a crisis. Whilst Fsociety plans its next move, E-Corp sees an opportunity in the chaos to consolidate its own power. Whilst all this is happening, Elliot has gone off the grid, living a simple life without a computer in sight...but still troubled by the memories of his dead father. At one point in the Season 2 finale of Game of Thrones, the character of Stannis Baratheon says of an enemy after he has shown his hand, "He has played his little trick and he can only play it once." 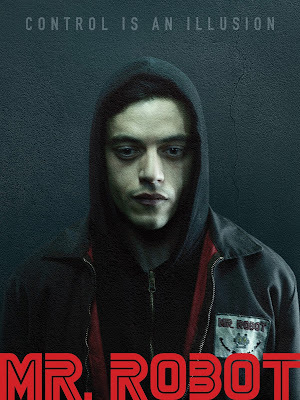 At the end of Season 1 of Mr Robot the show's creator, writer and main director Sam Esmail unveiled the mother of all plot twists on his audience, one worthy of The Sixth Sense and Fight Club. It was handled well and (in retrospect) foreshadowed expertly. But, just as M. Night Shyamalan found out in his latter career, you can only really do that kind of thing once or twice before it risks getting stale, as the audience tunes in to find out what trick you're going to play next rather than focus on the character or story, and the lengths you go to one-up yourself get increasingly ludicrous and, before you know it, the psycho trees have shown up. Esmail makes exactly that kind of mistake in the opening episode of the second season. He plays another trick on the audience and this is not made fully clear until more than halfway through the season. It's well-done and entertaining, but it's a clever gag that really should have been revealed at the end of the first episode (by which time it's already pretty clear what's going on). Dragging it out for half the season damages the show's already languid pacing and makes you wonder if the director-producer is a bit too pleased with himself for coming up with a second twist idea. It's all a bit tiresome and the pacing and structure of the second season is completely shot to hell as a result. The fact this is a longer season (12 hours rather than 10, although the first episode is double-length) doesn't help with that issue either. Fortunately, the show survives. Whilst the Elliot storyline goes on an extended trip to tedium for the first half of the season (enlivened only by an amusing experimental episode which recasts Elliot and his friends in a 1980s sitcom, complete with studio laughter track and a guest appearance by ALF), the rest of the characters pick up the slack. His sister Darlene (Carly Chaikin) takes over Fsociety and has to orchestrate their moves as they try to follow up on success of the hack but face problems from their erstwhile Chinese allies in the Dark Army. Angela (a superlative performance from Portia Doubleday) has been hired by E-Corp and ingratiates herself with its ruthless CEO, Philip Price, whilst working with Darlene to help bring the company down from the inside. Joanna Wellick (a devastatingly intense turn by Stephanie Corneliussen) is hunting for her missing husband and will let absolutely nothing stand in her way. Particularly impressive is new character Dominique DiPerro (Grace Gummer), who starts off as a fairly generic FBI character but rapidly gains added dimensions and depth as the season progresses, as well as a couple of excellent action scenes (shot in Esmail's typically off-kilter style). It's this accumulation of more interesting secondary characters and storylines which really keeps the show's head above water until Elliot's storyline re-synchronises with the rest of the cast and things can move forward (Elliot even sits out an entire episode and I didn't realise it until after it was over). I wouldn't say that erstwhile star Rami Malek is wasted in these opening episodes - his performance is absolutely outstanding, as normal - but once you realise his storyline is designed to keep him on ice for half the season it does feel a bit pointless. But once Elliot is back in the game the pacing and intensity of the show kicks up a notch and the last few episodes of the season are excellent, once you get over your annoyance when you realise that after 12 episodes we really haven't moved very far from the end of Season 1 at all. As with Season 1, the characterisation is subtle and clever, the soundtrack is utterly outstanding (bonus points for the well-judged, tactical deployment of Depeche Mode) and the unusual direction makes this possibly the most visually distinctive show on television. This is almost a remarkable work of art but it also strays into being cold and unwelcoming, more concerned with narrative trickery and holding the audience at arm's length lest they rumble the show's secrets. This is a show that is very easy to admire for its aesthetics but it's definitely a hard show to love. For the upcoming third season the show really needs to make up its mind on what story it wants to tell and dial back on the self-indulgence before it disappears up its own posterior. The second season of Mr. Robot (***½) is available now on Blu-Ray (UK, USA) and DVD (UK, USA).